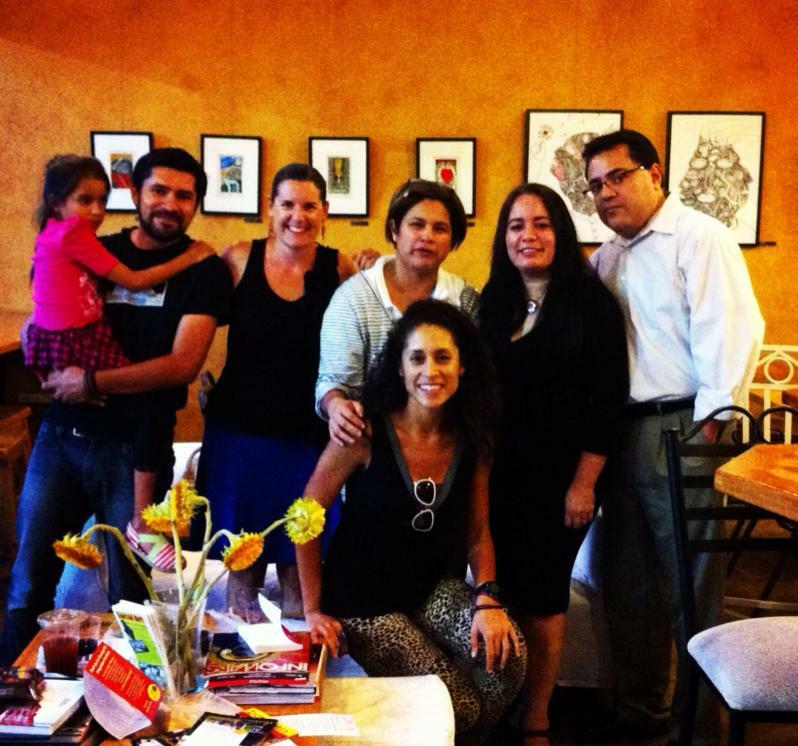 This month I had the chance to participate in a collective exhibition with a group of Latino Artists. 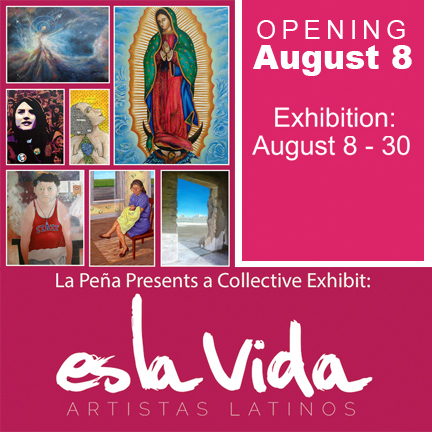 Our exhibition will be on display at La Peña until August 30th. 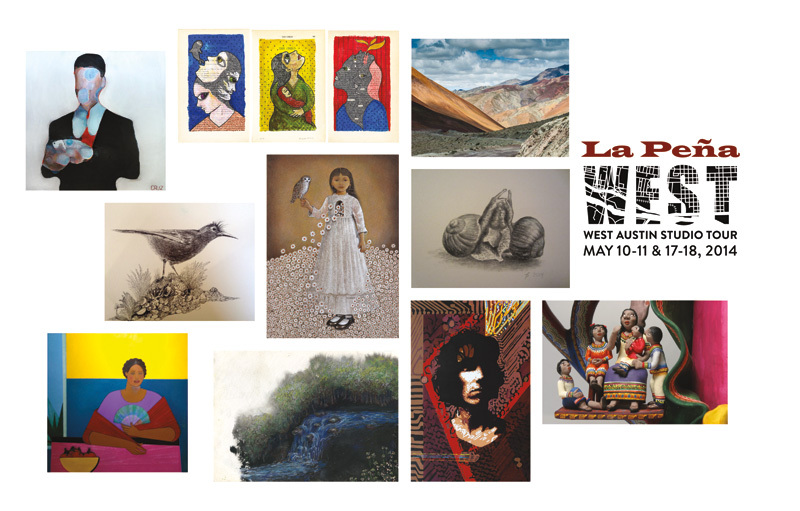 This year I had the opportunity to participate on the 2015 WEST Studio Tour with a group of fellow Latino artists from Texas. The Tour is during the weekends of May 09-10 and 16-17. 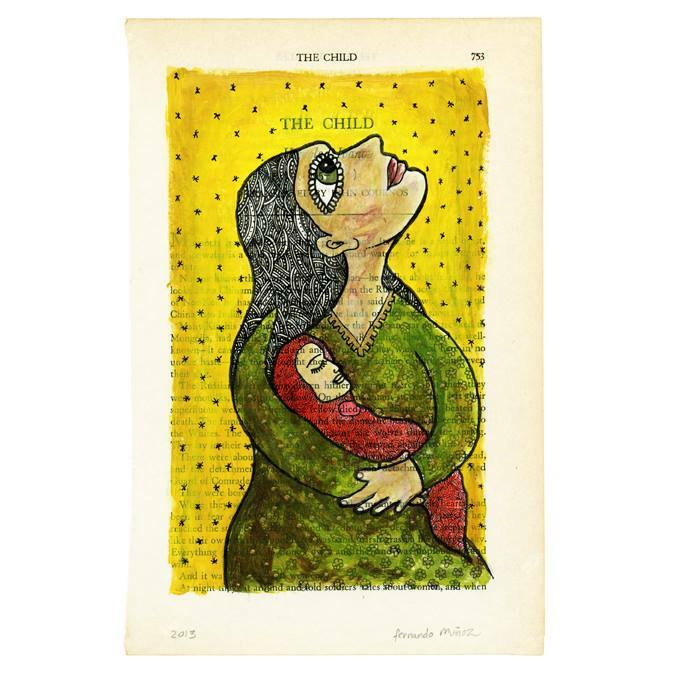 But, La Peña tied the tour to an exhibition honoring Gloria E. Anzaldúa, a chicano activist, scholar and artist who used the concept Nepantla in her writings and theories. Nepantla is a term that in short translates as "in between places" - it was used to identify that cultural "in-betweenness" experienced by people living in the borderlands or living in between two cultures. The opening of the exhibit was on November 1st. 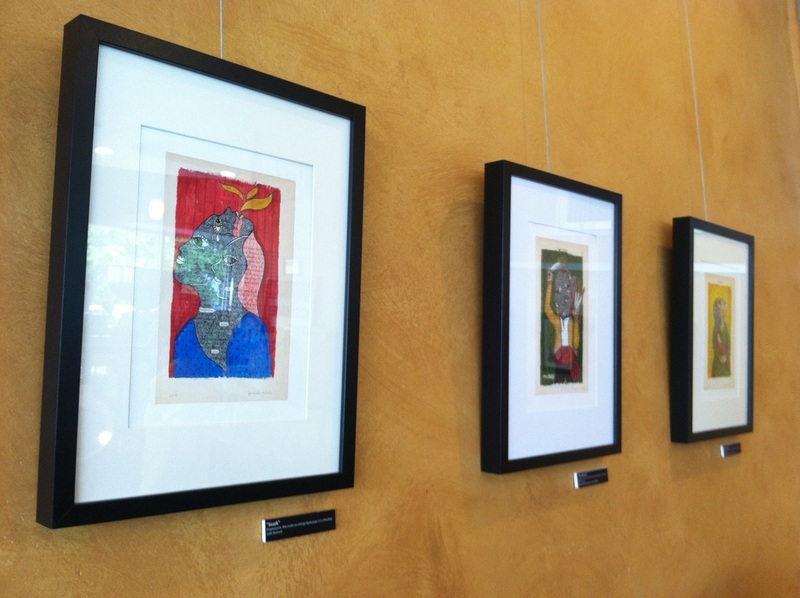 It was a great evening with a lot of people showing up and with beautiful artwork hanging from the walls. 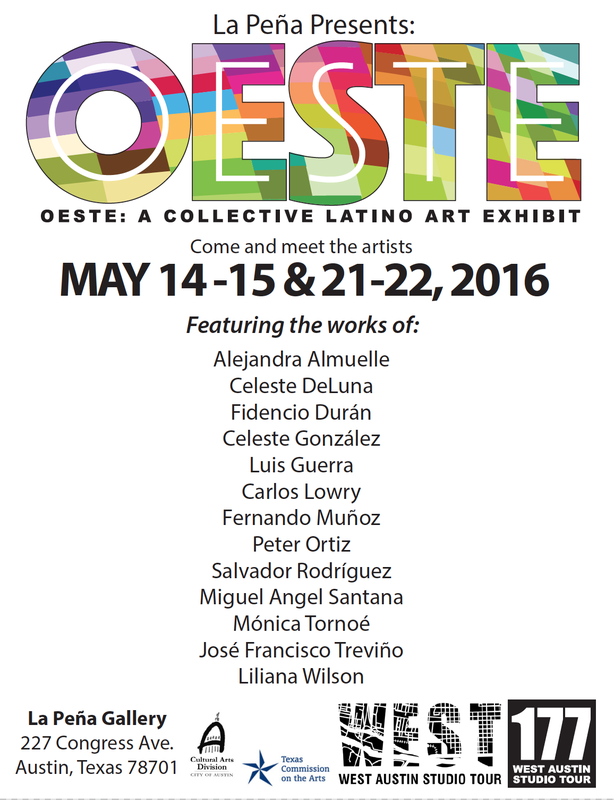 I feel very fortunate to be included in this group exhibit with a lot of different artists. 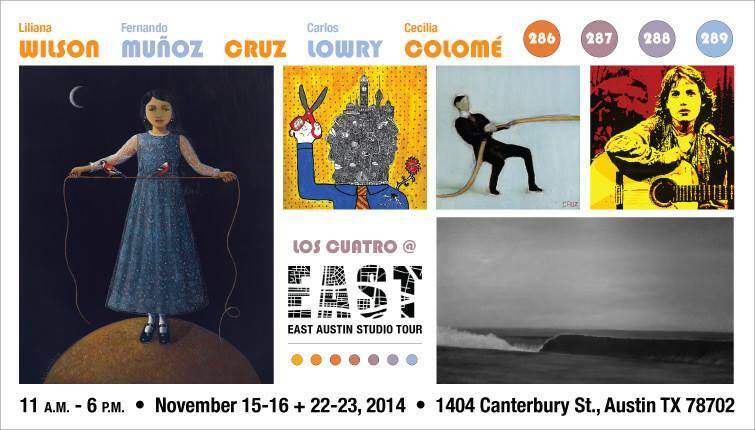 If you are interested the artwork will be on exhibition at La Peña for a few weeks at Congress Avenue and 3rd street. Ultimamente he estado trabajando en algo distinto a lo que venía haciendo, los dibujos utilizan una técnica similar a la de otras piezas que había hecho antes (ink markers y art markers). La idea de estas construcciones nació de la observación de como la ciudad crece y crece hacia arriba, esta conglomeración muchas veces rectangular y de superficies lizas, metálicas, de vidrio, etc. transmiten una sensación de frialdad. Mi idea era ver que pasaba si estas estructuras crecieran de manera más orgánica, inspirado por los nidos de avispas, casas en los arboles, nidos de golondrina y por una visita que hicimos hace poco a los pueblos enclavados en los acantilados en Arizona, surge una visión más lúdica del conglomerado multi-habitacional. Este es un trabajo en desarrollo, por lo cual no sé si he llegado al resultado final. He estado experimentando con técnicas y elementos dentro de los dibujos, la mayoría de los dibujos solo presentan las estructuras - sin habitantes. He probado algunas con gente en miniatura y también estoy tratando de construir las piezas en 3D, a través de la utilización de papel maché. When I started painting and making my drawings I never thought I was going to hang them in a public place for everybody to see, but with the encouragement of my family and friends I went ahead and started planning an exhibition. Thanks to a very good friend, Andrés Salvador. 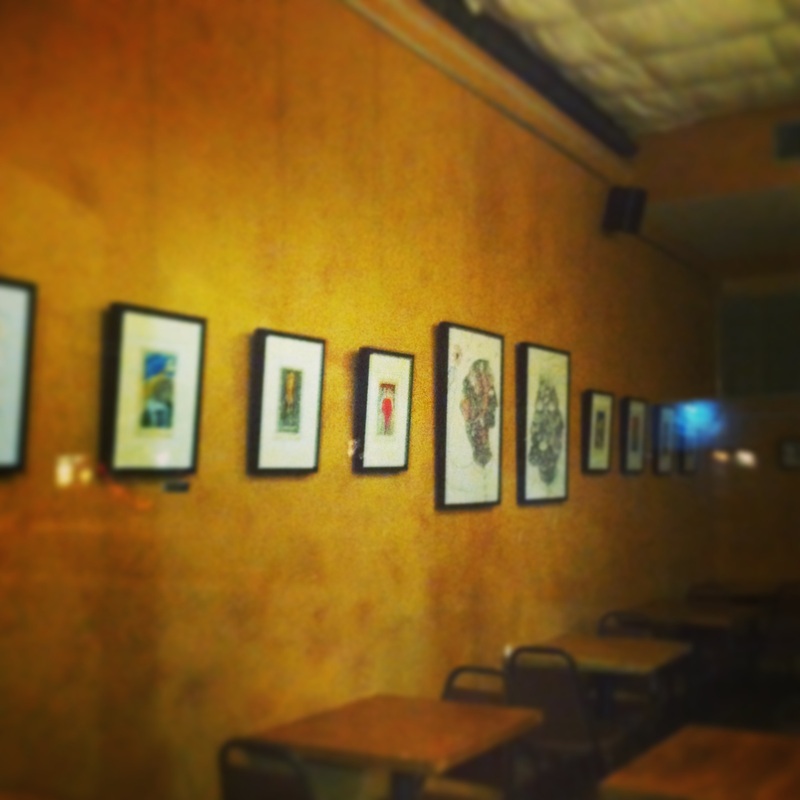 I was able to display my artwork at his coffee shop - Fair Bean Coffee in South Austin - where the pieces look very nice on the colorful walls of the shop. On September 12th we had a nice get together and it was a great way to start this new chapter of my creative life, I hope to continue doing art and sharing with you the process, ideas and results. 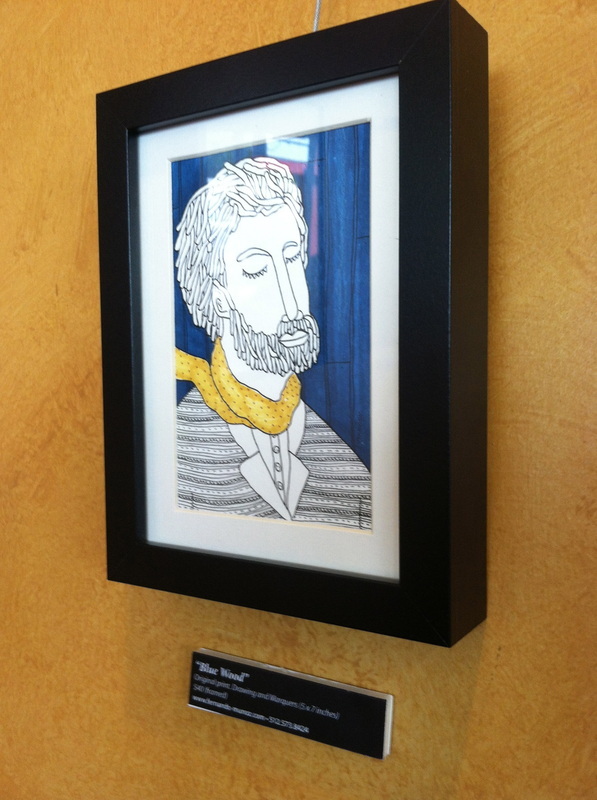 If you have the chance to visit Fair Bean, please do it and let me know what you think. This series of works started by chance, after a lucky find at the “books for sale” in my neighborhood library. Tellers of Tales was a book published in 1939 in New York by Doubleday, Doran & Company, the book is a selection of 100 short stories and was selected by William Somerset Maugham. The pages of the book have a double functionality as the medium and also as the inspiration for the art. 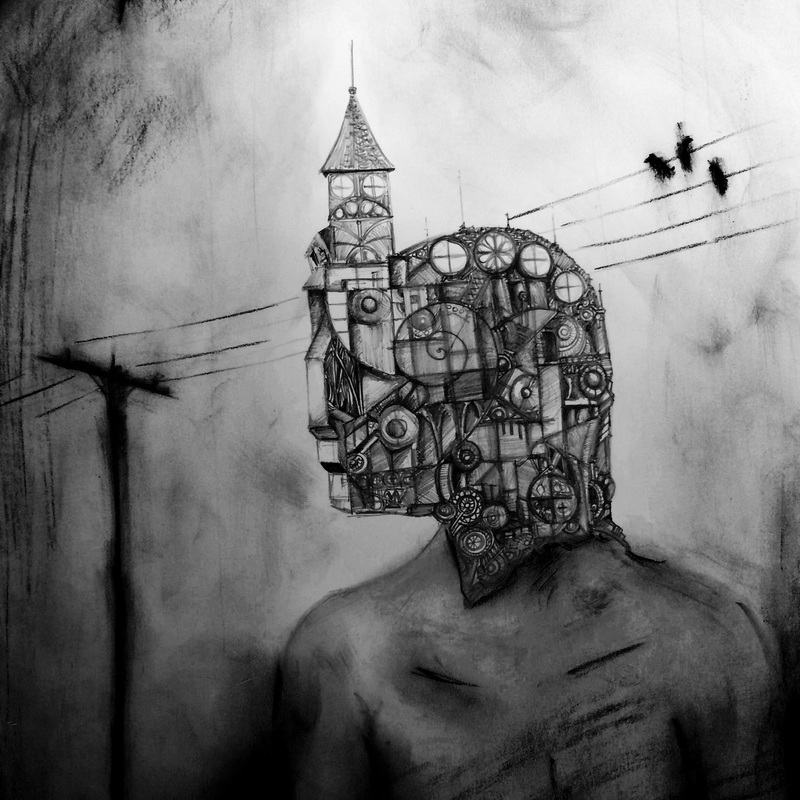 Usually I use the title of the story plus some highligthed words to create a character or image. Also, I try to stay away from the original story itself because I don’t want the artwork to become an illustration of the tale. This way my intention is to create a more ambiguos visual narration. 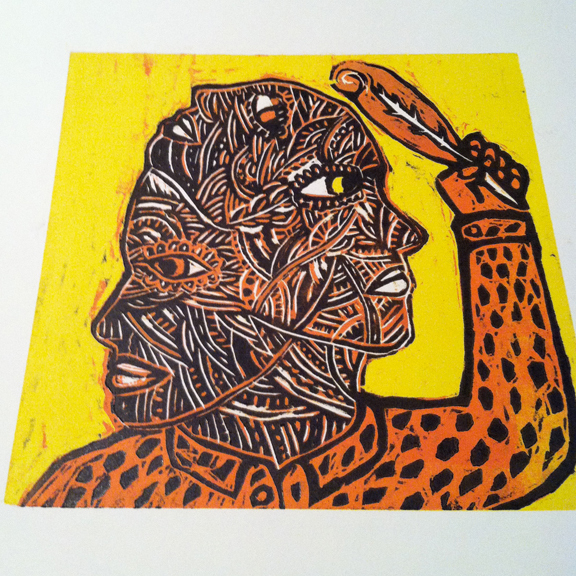 I just came back from Chile, I was visiting my family and decided to take a printmaking class. The experience was great and I had the opportunity to meet a few artists at Taller de Artes Visuales (TAV) which is managed by the friends of "La Pica del Grabado" - I did some Xylography, Reduction Woodcut and Chine Colle with my friends Marco Durán and Campana. 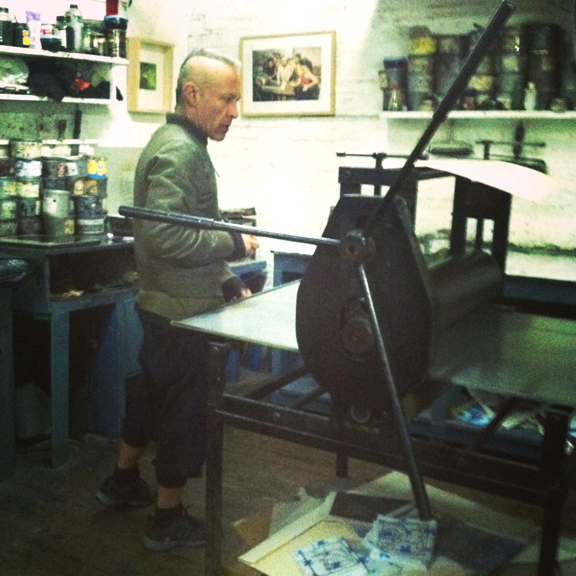 Also I was able to chat with a very experienced printmaker, Mr. Carlos Donaire. The workshop was great and the setup very nice and old school, it was great to be able to use the presses and the equipment at TAV, we managed the cold winter in Santiago with a small space-heater and the "mates" (a tipical hot drink) served by Campana. 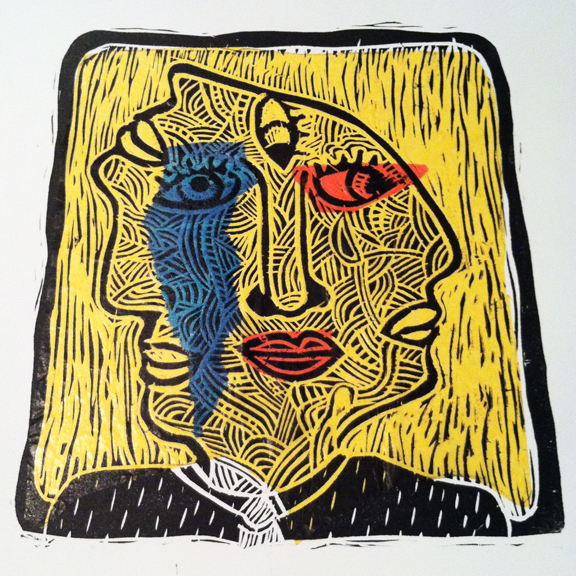 Reduction Woodcut - "Las Caras del Poeta"